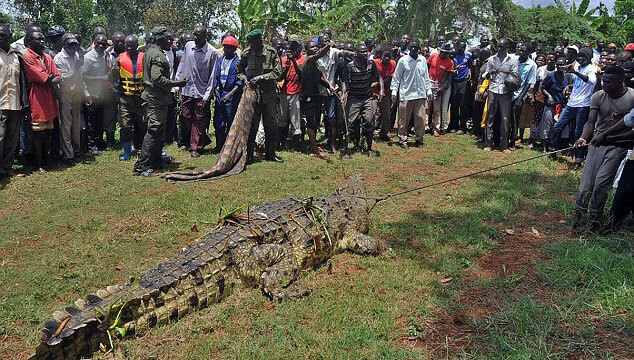 A furious fisherman has tracked down and killed the 20ft crocodile that ate his pregnant wife, Demeteriya Nabwire. Demeteriya had gone in search for firewood on the shores of Nawaikoke in Uganda but when she did not return after several hours, villagers began to panic. A search party was set up and they were horrified to find the pregnant woman's slippers, bloody toes, fingers and a mobile phone at the spot where she went missing. It soon became apparent she had been eaten by a giant beast surfacing from the river – the same 1,000kg creature had been blamed for the deaths of six women and children who had disappeared in the past year. So devastated husband Mubarak Batambuze of Kibuye village, went to the local blacksmith and spent his savings on the sharpest spear possible..
"I went to a blacksmith and paid him sh20,000 (£4.65) so that he could make me a very sharp spear." Batambuze went down to the riverbank and managed to find the 20ft beast near to where her remains were found last Sunday. The 56-year-old took his bloody revenge and hauled his catch up to the shore with the help of five other fishermen. He is now being hailed a hero by villagers for slaughtering the killer croc, which has terrorised families for over a year. A village spokesperson was also said to demand compensation from the Ugandan Wildlife Authority for Batambuze's lost wife. But officials said it's not part of their policy to pay out for people killed by crocodiles and added they are currently capturing reptiles and relocating them to another area.